Kidrobot x Nick 90’s Capsule Online Now! Here is another Kidrobot blog by our good friend Chris Holt aka The Toy Viking! about the new Kidrobot x Nickelodeon Nick 90’s Capsule including the Nick 90’s Vinyl Art Mini Series 2 and more! Nostalgia trips are already the best, but when you take one with Kidrobot and Nickelodeon you know it’s going to involve you getting something awesome out of the deal. Not only will you be transported back to a time you remember fondly but you’ll have a modern memento of your journey. And its a way better souvenir than those shirts that say “Lifeguard” that people get when they visit sea side resort towns, even though they know they can’t swim. You’re not fooling anyone. I remember the ’90’s like it was practically 20 years ago. You get home from school throw some pizza rolls in the microwave, and turn on Nickelodeon to watch the most epic lineup of cartoons to ever exist. Those were the good times, when logging onto the internet required an engineering degree and we somehow figured out where we were going without the aid of GPS. Each one of these figures recalls a simpler time in many of our lives that we can now share with generations to come. Take a walk down memory lane with me. Just make sure you watch your step, memory lane has an issue with people picking up after their dogs. He’s big. He’s bad. He’s Tommy Pickles favorite thing in the whole world . He’s Reptar. 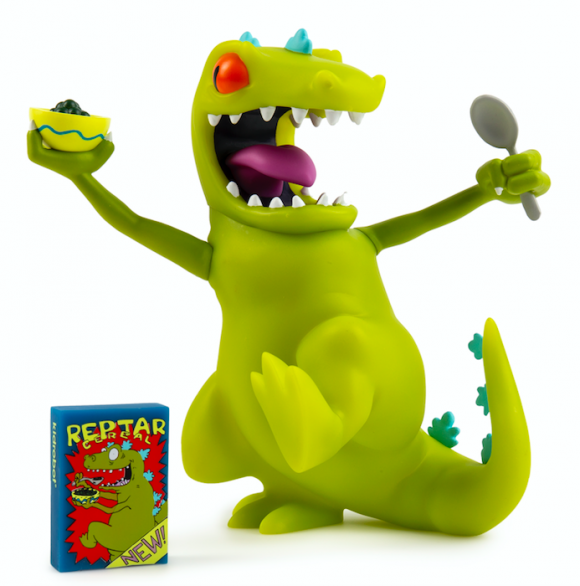 This thunder lizard has appeared in many forms, both on Rugrats and in real life, and now he joins the world of vinyl collectibles. Look how happy he is chomping down on his signature cereal. It’s the little things in life, people, like this seven inch tall reptile who you can’t help but smile at when you look at him. 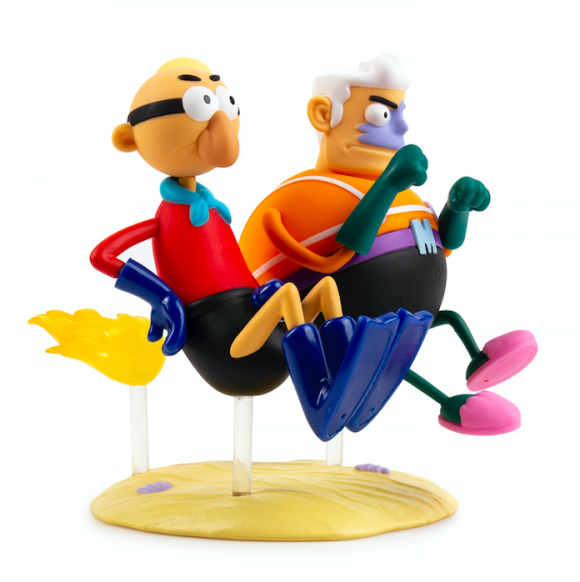 Hot on the heels of the popular first series comes the next wave of blind box mini figures from your favorite cartoons. Featuring characters from Rocko’s Modern Life, Aaah! Real Monsters, Rugrats, SpongeBob Squarepants, Wild Thornberrys, and Ren and Stimpy, each box will surprise you with what’s inside. There’s 18 different figures to collect and that’s almost enough to recreate all of your favorite episodes. 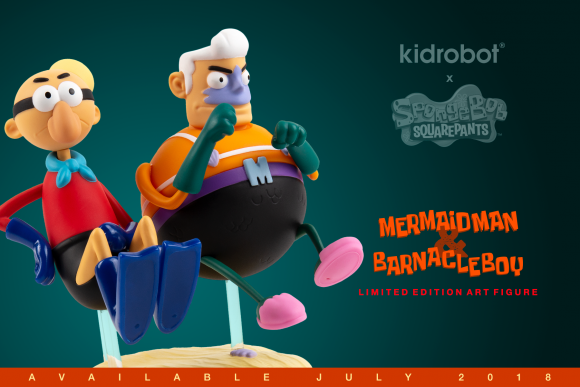 Last but certainly not least is the Mermaid Man and Barnacle Boy medium figure. Bikini Bottom is always safe when these two underwater super heroes are around. They are featured here with their invisible boat mobile, and though they may be mostly retired, evil doers better beware. As soon as they’ve had their nap. Everything you see here is available right now at www.kidrobot.com.